Happy November, book lovers! I've got two weeks of bookish goodness to share with you since I didn't have time to post a STS/What's Happening last weekend. Here we go! I've been in a bit of a reading slump the last couple months, so I'm getting behind in my reading. I have a ton of review books to catch up on, and I was planning to concentrate on those in November...but then OF COURSE these three books - which are three of my most anticipated novels of 2013, and which I requested ages ago - came in at the same time and I can't not read them. I keep alternating between sighing and squeeing. Hopefully these will get me out of my reading slump! I signed up for the 2014 TBR Pile Reading Challenge. Can you believe it's that time of year already?? I started participating in IceyReads' What's Next weekly meme. The first week I needed help choosing between The Coldest Girl in Coldtown, Fangirl, and Out of the Easy. This week I needed help choosing between These Broken Stars, Sia, and Full Ride. You can still weigh in on this week's decision! I reviewed If Only We by Jessica Sankiewicz, and was also part of the blog tour, where Jess shared a playlist of her favourite songs from The OC. There's also a big tour-wide giveaway! It's been a busy couple of weeks. I've been out with friends quite a bit. I went out dancing two weeks ago for the first time in over a year and it was amazing...even though I paid for it for two days after with the hangover from hell and what I suspect was a case of alcohol poisoning lol. My family was supposed to do a photo shoot with a professional photographer, but my sister-in-law and I decided we wanted to wait until spring to do all of us, so we just had the kids' pictures done instead (my nephews are 11 and 3, and my niece will be 5 months old next week). I can't wait to see the pics, and I'll be sharing some of them here when the photographer sends them to us! I got to meet Kelley Armstrong last weekend at my local library. She talked about her books, did a reading from The Summoning, and did a Q&A before signing books. I went with a couple friends I haven't seen in years, and we had a blast. I went out for Halloween with my sister-in-law, nephews, and niece. We went trick-or-treating around their neighbourhood, and it was so much fun! I love Halloween. Maddy's first Halloween! The cutest little chick in the whole world. Is it weird that I enjoy dressing up even more than the kids do? NaNoWriMo starts today, and even though November is going to be one heck of a busy month, I've decided I am going to participate after all. Gods help me. The novel I'm working on is an idea I've had for awhile, so I'm hoping I won't have too much trouble with it. If you're participating, feel free to add me as a buddy and/or tweet me for moral support/distraction/advice/sharing of insanity, etc. 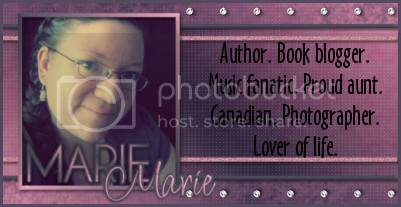 And finally, tomorrow (Saturday) I'm heading to Toronto for my very first blogger meetup! I've been freaking out all day with excitement and nerves. I finally get to meet some of the people I've been talking to online for the last 3 years (including Kathy from I Write, I Read, I Review, who I'll be getting a ride with), plus other bloggers who will be new to me. I'll do a recap early next week, and I'll likely be doing my first vlog in ages to talk about the event and show the books I've trade for. ^^ i hope you will have fun at your meeting with other bloggers! You've had a busy week! LOVE the Halloween costumes ... and you're right. Definitely the cutest little chick! Yay for the blogger meetup and yay for NaNo! You talked me into it, so now we must win together! I wish you all the luck! Cute pics! Curious to see your review of Degrees of Wrong. I've had it on my TBR list but the mixed reviews I've seen have kept me from buying it just yet. You HAVE been busy!!! And you are kinda insane for participating in NaNo, but, hey, your insanity is why I love you. I will be here to cheer you on! *jumps up and down and pumps fists into the air* Go MARIE!!! Lovely pictures :) Heh. I hope you get out of your slump and get to read your three new copies soon. As for the rest of them, I'm so jealous of people who're already getting winter/Christmas reads. I don't know what to buy, but I can't wait to get some:) I hope you enjoy all of your lovely new books though! I just finished Coldest Girl in Coldtown : ) Enjoy your books! It looks like you had a good time this halloween. I like seeing the costumes and etc.... You got a lot of books and read a lot of interesting books this week. I enjoyed Endless Knight a lot. Snowed Over looks like it'll be so cute! Happy reading! That chick costume is adorable! I'm really excited about Christmas reads this year, but I feel like it's too early to tell people that (my friends are in Christmas denial until after Thanksgiving haha). Cute pics! I am currently reading Something Strange and Deadly. It's ok but I'm not completely impressed with it. I will probably still read the rest of the series though. Hope you enjoy everything you got and you get out of your reading slump! Great post. I'm glad that it's not just me that's looking at Christmas books. You WOULD get Endless Knight JUST as I'm reading Poison Princess. Man that prologue? CREEPSHOW. Really eager to read more hopefully today. Aww the kids were so cute in their costumes! What a great haul this week! I need to read all of Susan Dennard's books ASAP. I'm doing NaNoWriMo this year. First time participating & super nervous. You got some interesting books for review, I added them to my list to check them out. Whoo!! It was so nice to meet you too Marie! Oh I have to find space for all my books too. Isn't it funny how we have no room every time we have hauls? Lol I hope you enjoy Thornhill! I still need to get that one since I enjoyed Hemlock!